Guest speaker is Horry County Sheriff Phillip Thompson. NEW LOCATION – Brickhouse Lounge, 510 Highway 17 North, Surfside Beach 29575 – next to Dagwood’s! Fully accessible to all – no more stairs!!! 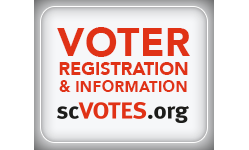 Join South Enders to discuss voter outreach and registration at special events.